I was hoping to minimize the sadness of the realization that I will have to separate Chooey and Peanuts by avoiding it for some while. As I've mentioned when we introduced Chooey into our pack, she is our temporary sister. The time has come that she will meet Buchi. Chooey and Peanuts enjoying the day with a puppy visit. On Tuesday, I will be leaving for my sister's. Unfortunately, it will be quite some while before Peanuts and I can reunite again. Peanuts will be living with my beau, which to her advantage will spoil her rotten (allowing her to sleep on the bed and such). So don't be sad about Peanuts, she's actually in better hands than mine (without the flashy beast following her, too!). It might be a couple of days before I can make a new post so please bear with me. 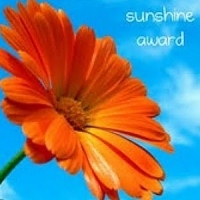 This Sunshine Award came from Sheba's Life Story. I have received the Sunshine award from Ian and Sheba so I'd like to thank you at the bottom of my heart for this. I hope you don't mind me linking my old post on this one, Ian. We know Peanuts is going to a good home. Have a lovely weekend. I am sure Peanuts will be in good hands. Have agood Saturday! Not quite sure what's happening.. Did we miss some earlier post that would shed light on this? Hmmmm. Thanks for dropping by. I will go to my sister so and I can't bring Peanuts with me so she will need to stay with my beau/boyfriend in the mean time so that someone can take good care of her. Chooey on the other hand will stay with Buchi and my sister. We're sure everything will work out well!!! Have a lovely weekend! Hope Peanuts has a nice time being spoiled rotten! You gave Peanuts the best home while she was with you,, and now she will have another wonderful home. It will all be okay. oh there is some sadness, but also some gladness because Peanut will have a wonderful home! Oh, I'm so sad to hear this, Haopee. We are purring and praying for you that everything works out for Peanuts, Chooey, Buchi AND all of you humans. Thanks correct guys. Since I can't bring Peanuts to my sister's then I have to leave her in the good hands of my beau who will stay here in our city. I, on the other hand, will need to go to my sister with Chooey unsure of the date when I'm coming back home. Are you going to be away to your sisters for a long time? Are you taking chooey with you? Maybe I missed a post, so I'll go back and see if i did. BTW, isn't always the men that seem to be the ones who really spoil the dog? I totally agree with it. I would not have allowed Peanuts on my bed but my beau have always wished to have a dog sleeping with him. Congratulations on your Award! Have a safe journey. I was confused earlier by this post...now I see you are having to go away to your sister's and Peanut will stay home with the Beau - that's not so bad. Just sad for you and Peanut, who will miss you for sure! How far away will you be? Sounds like everything will be just fine anyway. Have a good visit. Chooey will love her new sister but it will be hard for you to leave her with your sister when the time comes. Aleast you get to visit often, so it is not a permanent goodbye...sad nonetheess...Peanut will enjoy the spoiling but will be nothing but tail wags and kisses when you return. You obviously love your family--both two- and four-legged--very much. Farewell for now little Peanut! we will see you soon. In the meantime, have fun and enjoy the spoiling! Oh Peanuts, yous going to be just fine, and so will Mama. 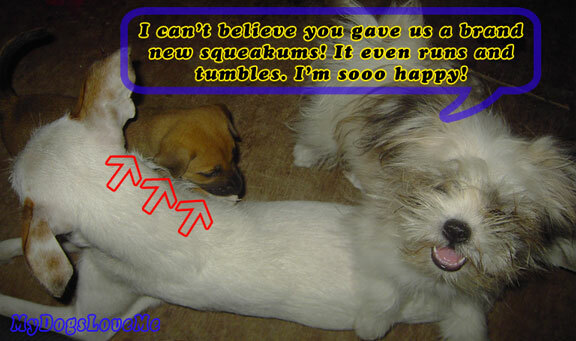 I hope you guys gets to keep your brand new squeakums, though :D I thoughted I was following your dogblog already, but I no was, so I has clicked the following button today.